Northwest Florida has powder-white sand, emerald green waters and an abundance of true Southern hospitality. Though summertime is typically high season for visitors here, a gentle change of seasons means that your visit will be pleasant any time you choose to come. Lush, rolling hills dotted with plantations, fragrant magnolia trees and a handful of truly spectacular canopy roads grace the countryside around Tallahassee, Floridas capital city. A mix of historic and natural attractions are found here: tour sites such as the Old Capitol building, one of the world's deepest freshwater springs, botanical gardens and several museums, including the new Museum of Art/Tallahassee. Pack your swimsuit, forget your cares and head for the best kind of family fun on Northwest Florida's famous white beaches. These stunningly beautiful sands and emerald green waters are reason enough to plan your escape here, but you'll also find a welcome worth remembering. In addition to beachcombing, active visitors will find plenty of opportunities to golf, go boating, snorkel and dive, or enjoy world-famous fishing. 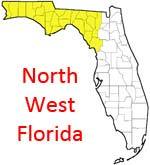 Besides her beaches, Northwest Florida claims some of the most beautiful lakes, bays and rivers in the state. Pensacola, at Florida's extreme western tip, was the location of North America's first European settlement, with Spanish colonists arriving here in 1559. The city's fascinating history can be explored at such sites as Historic Pensacola Village; the Seville, Palafox and North Hill historic districts; and Civil War-era Fort Pickens, which at one time held Indian chief Geronimo prisoner. Beach-lovers will enjoy Pensacola Beach and nearby Perdido Key for their more than 40 miles of Gulf shoreline, over half preserved in federal and state parks. Navarre Beach, just across the Three Mile Bridge from Pensacola, is the western end of what is known as the Emerald Coast. With neighbouring Gulf Breeze, Navarre Beach offers four miles of beautiful white beach and dunes, much of it undeveloped. Many families choose to holiday year after year on the sparkling beaches of the Destin, Fort Walton Beach and Okaloosa Island. Signature emerald-green water and brilliant white sands provide the perfect backdrop for fun, and with more than 100 festivals and events held annually, a good time is always close at hand. Destin's claim to fame is its status as "The World's Luckiest Fishing Village," no idle boast since the city claims five saltwater world records and harbors the largest charter boat fleet in Florida. With town names like Seascape, Hidden Dunes and Mainsail, it's no surprise that the Beaches of South Walton, east of Destin, still maintain an "Old Florida" appeal. Here, cottages nestle among dunes and sandy roads sometimes lead to nowhere in particular. Visitors may explore 18 small beach towns here, including quaint, artsy Grayton Beach and the much-acclaimed Seaside. Bicycling enthusiasts can travel South Walton's most picturesque roadway, Scenic Highway 30-A, on wide, off-road pathways that wind alongside lakes, woodlands and beach areas. Visit Panama City Beach for an old-fashioned family vacation, complete with colorful amusement parks, arcades, miniature golf, souvenir shops and a big, beautiful beach. A wide variety of accommodations, ranging from waterfront resorts (both on the beach and on the bay) to smaller motels, ensure that vacationers will find something to suit their style and budget. Jewel-green waters and white sands, fishing, boating, wreck diving and golf have made Panama City Beach a growing Holiday destination for families from all over the globe. Off-the-beaten-path destinations in Northwest Florida include quiet Mexico Beach, the fishing community of Port St. Joe with its summertime scalloping, and Apalachicola, famous for its oysters. Time seems to have forgotten charming Apalachicola where visitors can walk streets framed with ancient oaks, peruse art and antiques shops, and stroll past historic homes and buildings, more than 250 of which are on the National Register of Historic Places. St. George Island has unspoiled beaches and the 1800 acre St. George Island State Park. Inland, the crystal-clear spring-fed waters of Milton provide exquisite canoeing, while camping and hiking adventures await visitors in the region's state parks.